For anyone interested in the study of the Roman army. The Roman Army School has been well established for many years now. Previously it has run alongside the Hadrianic Society’s annual reunion, but in March of 2018 The Society sadly made the decision to close. Several of us decided that we would like to keep the Roman Army School aspect going and so here we are, taking the reins and doing our best. Please bear with us during this first year as we make the transition from being part of a fully functioning, well- established society into being a stand-alone once-yearly meeting. We are only human, we are learning the ropes and at some point, we are likely to make the odd little mistake whilst we sort things out. Please stick with us; it will all be alright in the end. The aim of the Roman Army School is to encourage an interest in the Roman army and to share our knowledge. We do this by organizing an annual conference, open to anyone with an interest in the Roman Army. A theme is chosen for each meeting and speakers, specialist, academic and laymen are invited to make presentations, sharing their knowledge and latest thinking and discoveries on the subject. Lively discussions have been known to continue beyond last orders at the bar. We are a friendly, if slightly odd bunch of folks, open to making new friends. If you see us at the meeting don’t be afraid to come and say hello. This was the final year in which the Roman Army School ran in conjunction with the Hadrianic Society. Prior to 2018 the two events had always run concurrently and had practically merged into one event. Following a ballot of its members in 2017 the Hadrianic Society officially closed as part of the 2018 meeting. Several volunteers opted to endeavour to continue the running of the Roman Army School and so here we are in our first (let’s call it a pilot) edition of the conference round up. The conference was held in the library of St. Chads College in the North Bailey of Durham University. 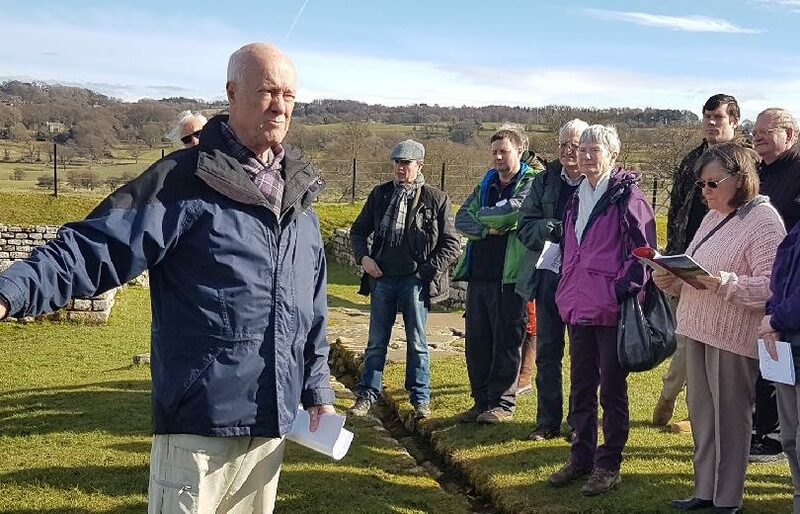 The Hadrianic Society Reunion weekend usually runs from the Friday evening until mid-day of the Sunday with the Roman Army School lectures beginning after lunch on Sunday and running until Tuesday lunchtime. The Hadrianic Society held its closing AGM on Friday evening in the suitable surroundings of St. Chad’s Chapel. Saturday was taken up by the final trip to the Wall. This was undertaken in unusually good weather and we visited the Roman Army Museum and the fort at Chesters for an examination of the barracks, and officers’ housing then back to Durham in time for the bar to be opened, (visitors to the Roman Army School will soon realise what an important part in the whole proceeding the bar plays in aiding networking and aiding discussion). The first lecture on Sunday was giving by long time Hadrianic Society member, Beryl Elliott and involved an examination of the wonderfully inspiring life of the later Roman matriarch, Galla Placidia; daughter, sister, wife and mother of Roman Emperors. Following a break for tea, coffee and discussion, during which period the technology was fixed, the room reassembled to hear Kurt Kleeman look back on thirty years of excavation and the evolution of the Roman museum at Remagen. Lunch time afforded a brief period of relaxation in which to absorb the information imparted in the two morning lectures than if was back into the world of the Roman Army again as Val Maxfield gave a lecture discussion on ‘Military Decorations’, including, but not limited to, rewards of plunder, such as captured torques and the various Corona (crowns) which could be achieved for battle valour. A brief afternoon coffee break followed this, you have to run if you want the good biscuits in the afternoon, and then the afternoon lecture was given by Jon Coulston on recognising ‘Officers and Soldiers’ on Trajan’s Column in Rome. Spoiler alert: you can’t really tell the difference, certainly between officers. This was an interesting walk through of the frieze on the Column analysing the soldiers’ activity and explaining how the images cannot be taken at face value. Following dinner, the evening lecture slot was taken by Graham Sumner and comprised a wonderfully light and funny hour on ‘Military Clothing’. 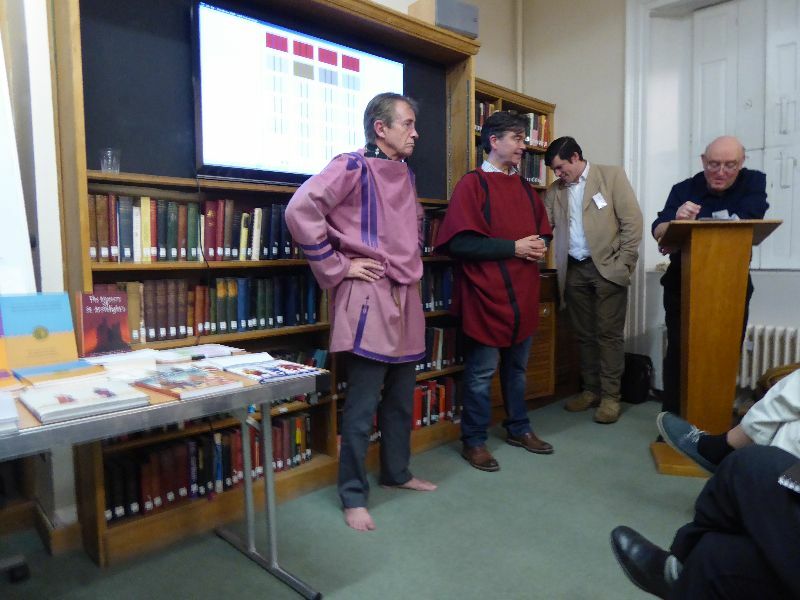 Many laughs were had as Richard Bridgland and Steve Huneysett rather gamely dressed up as off-duty Roman soldiers allowing Graham to demonstrate the changes in clothing throughout the history of the army. Monday began with a great lecture from Jorit Wintjes on General Lucius Quietus, an individual about whom relatively little is known. Indeed, the only hard facts were the man’s name and rank if I recall correctly, so an hour lecture on such scant evidence is an impressive feat (one I wish I were capable of). The midday slots housed a pair of lectures by Jonathan Eaton and David Breeze, looking at Centurions and careers in the army. It appears that becoming a centurion was about the best thing a military man could do (beyond further promotions, although one had to be well connected for some of those). It appears that once in place a centurion was very hard to dislodge or convince to retire; indeed, beyond potential death in battle, serving as a centurion was a good set up for the duration of a career. The late afternoon lecture on Monday was given by long-time Hadrianic Society member Ernest Black and involved a detailed look at Strategic Planning in Britain in the 170s, outlining new and occasionally controversial theories to challenge the listeners and raise new questions. Monday evening was a lecture on ‘Naval Officers’ by Richard Bridgland, examining the use of the Roman fleet as a water-borne adjunct to the field army, although with its own evolving type of commanders. Notably though Roman ‘professional’ naval endeavours, such as Sextus Pompey, Mark Antony and Carausius all seem to have ended in failure. As usual a number of stimulating conversations arose in the bar after lectures, certainly two memorable ones from this year were Richard Bridgland’s account of the time certain members of the Ermine Street Guard tried out `authentic’ Roman underwear. The result of which, we were reliably informed left one poor chap unravelling whilst performing and trailing a line of linen across the field during manoeuvres. Graham Sumner also recounted a tale from the Ermine Street Guard in which during a charge one individual tripped and brought down most of the unit leaving the front runners tearing across the battlefield unaided. Another conversation revolved around the replica saddle created by Peter Connolly and David Breeze’s statement that it was perfectly possible to vault into the four-pommelled contraption unassisted. A feat that is certainly believable as it happens all the time in Cowboy Films, but most of us would like to see happen (David reports that the event was photographed and the photograph published). The annual Roman Army School will meet at St Chad’s, Durham, in 2019. The subject of the meeting will be Roman artillery and sieges, inspired by the recent publication of Alan Wilkins’ Roman Imperial Artillery. Alan and his colleague Len Morgan will speak and also demonstrate their replica Roman artillery pieces. Guy Stiebel will lecture on recent work at Masada and other sieges in the East and Jorit Wintjes on artillery in the field. Graham Sumner will be on hand to put colour onto sculptural depicts of Roman artillery. Other speakers include David Breeze and Val Maxfield on the evidence from Britain. We at the Roman Army School want to provide an interesting and entertaining program of lectures each year. To do this we need a different theme to explore for each meeting. Below is a list of possible future courses but we’d love your input too. Is there a specific topic that you would like to see us cover? Can you think of something that may work well with the list below? Don’t be shy talk to us!